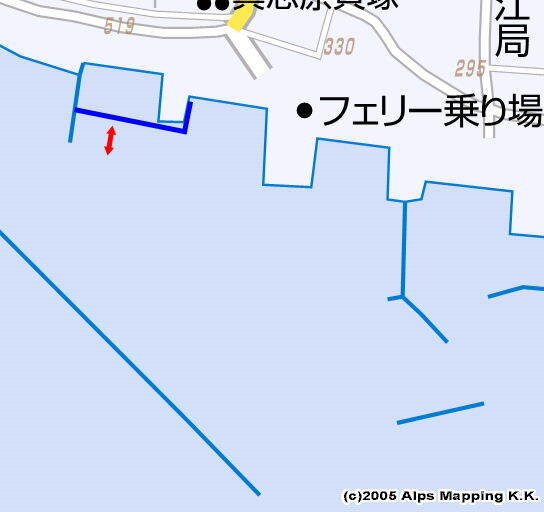 change the boat direction to the left and proceed into the middle of the port. There is some mooring space in the innermost area. As there were two sail boats in the right side, I put my sail boat bow-to in the open space. I visited the same place again in April, 2007, next to JUNSEI II which was a local sail boat of a local yachtsman, Kaneshiro-san. When I entered, the right side was empty just with a buoy and ropes around a bitt. 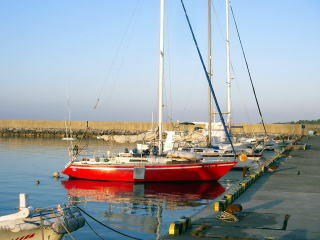 But, on Saturday 14th, a catamaran yacht came in. Was the buoy owned by this catamaran ? As here is not a fishing port, no complaint. Gushi fishing port is in the east. There is a toilet, open 9 to 5, at the ferry station next to Tourist Information Office. Another 24hr open toilet is on the top of the up-close slope. In the back of the 24hr toilet, there is a water tap which key is required to open. A coin laundry is next to Inn “Kariyushi” 5 minutes away. The largest supermarket is A-COOP, 7 minutes away. A restaurant is at the ferry station.No public bath house. There is a fee-based shower at Ie Beach, 15 minutes bicycle riding away.